Samsung got more buzz from their keynote at this year’s CES than they should have because Michael Day walked off the stage. 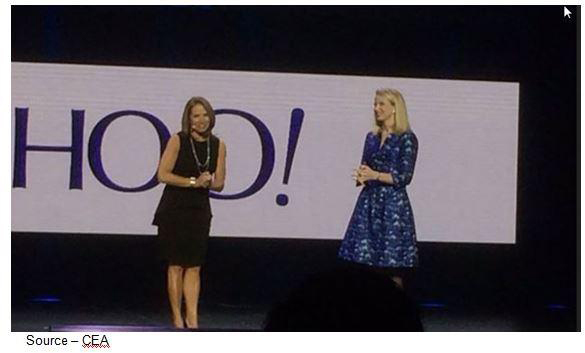 Sure, Marissa Mayer, Katie Couric, John Chambers and Ford’s Mulally (ex-MS boss contender) make it look easy. But standing in front of a huge crowd wanting to make a great impression isn’t easy. Onstage, Online – Katie Couric (l) and her new boss, Yahoo’s Marissa Mayer, introduced the new content-driven online firm with confidence, flair and style. The journalist and host on all three of the country’s major networks recently moved to Yahoo to lead a new chapter in online journalism and entertainment. They rehearse a lot and still they have sweaty palms and upset stomachs when they step on stage … that stuff ain’t easy! And people love to talk about the crashes. Despite the glitter and glamour of the show, Cisco’s Chambers set the stage for all of us with his vision of The Internet of Everything. 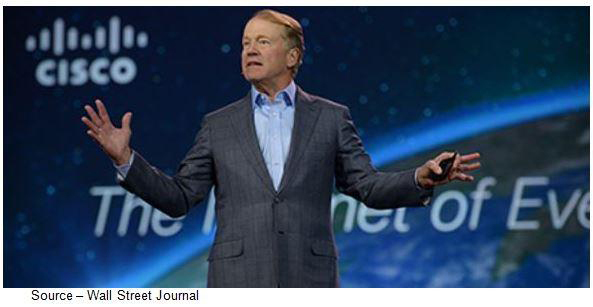 Everything, Everywhere – For the past few years, Cisco’s John Chambers has been warning everyone that content will overflow on the Internet. Based on some of the firm’s newest research, they have developed a new mantra – the Internet of Everything – that will include more than 50 billion connected things. Chambers says it will be a $19 trillion business in the near future. Chambers sees Internet-enabled objects everywhere he turns and CES was no exception – cars, home appliances, streetlights, garbage cans, you name it. All of CES – 1.8 million square feet, 3,200 exhibitors, 152,000 attendees – was his to connect. Chambers sees a $19 trillion business in the private and public sector over the next few years and all of the exhibitors at CES were ready to carve out a chunk of that business for themselves. Of course, Intel’s Brian Krzanich wasn’t going to be left out, even though his vision was only The Internet of Things. Everything vs. Things … tomato, tomato. While Mulally’s Mustang muscle car got the older crowd thinking young, it was the promise of tomorrow that made most folks think that Chambers just might be onto something. Both Cisco and Intel (and everyone else in the CE industry) are working closely with the automakers to put their technology on four wheels. Cars aren’t the first consumer product that comes to mind when you think about technology, but today 40-60 percent of their cost is mobile technology. Heck, every automotive manufacturer has a design center in Silicon Valley and just down the street from them is Nvidia, AT&T, Google, Yahoo, Qualcomm, MS and everyone else. They’re all moving rapidly – for car manufacturers – and none is moving faster than Audi. In addition to infotainment, driver assistance and battery/solar/hydrogen technology they all showed off their autonomous driving solutions like they were ready for sale today. Laser Sharp – With cars continuing to incorporate more and more technology, automakers have begun bringing their polished presentations to CES to show folks how “with it” they are when it comes to technology. 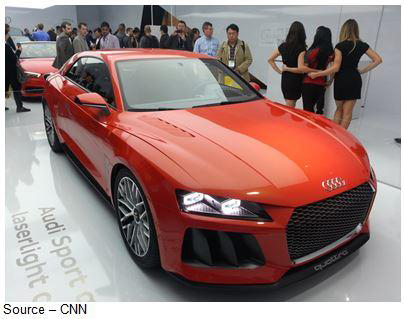 Audi showed off their new LED/laser headlights that can light the way ahead more than five football fields. Cutting through the show noise (sorry for the pun) was Audi’s laserlight technology which they say will illuminate the road for 1640 feet (3x LEDs). The auto folks also have added their black box (event data recorder) technology so they can follow just about anything/everything you do and where you go … cool! Google, Facebook, Yahoo already see ways they can use the technology to help you find out where the best deals for the stuff you want as you drive by. The technology is in almost every car sold today; and in September, it will be mandatory so that’s keeping a lot of privacy groups and bureaucrats busy. If you can’t afford to drive your technology, there were plenty of folks at CES who tried to convince you it was time to wear it. 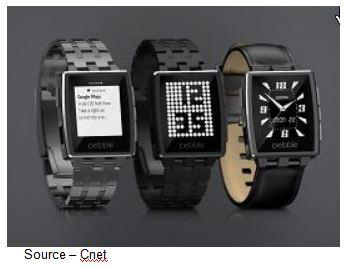 Pebbles of Tech – Promising to do everything, including telling time, a lot of industry fortunetellers are saying that wearable technology will be the next huge thing in the consumer electronics industry. People with health issues, fitness nuts and techies are buying the devices but they have a ways to go before they become a useful fashion statement. I have a number of friends who love to show off their smartwatches – wearables – for keeping track of their meeting schedules and text messages. What I can’t figure out is since the CE industry has so embraced fashion, why these things are freakin’ ugly! Gartner, IDC, Forrester and others are all projecting wearables are going to be a multi-multibillion dollar business, but jeezz! Sure, I get it for people with health problems. There’s a real need and they could literally be lifesavers. But most of the ones “introduced” at the show were simply pitched as the exciting, fun thing for retailers/etailers to carry … and sell. Yes, I have a FuelBand for my workouts; but I also saw wearables on a lot of folks at the Las Vegas McCarren Airport who really needed to pay attention to what the sucker was telling them. As for being constantly connected, no one goes anywhere today without their smartphone that does it all … including telling time anywhere in the world. And you can wrap them in any fashion statement you want to make. Of course, for the folks who really want to be noticed, there’s Google Glass or some of the new more obvious headsets that were introduced. 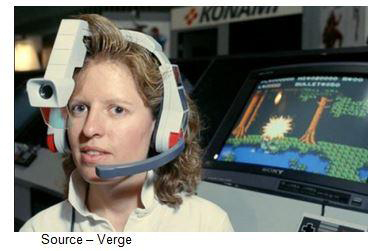 Connected Headdress – Lots of companies are working hard to advance headware technology beyond the Google Glass. It’s still a work in progress. Yes, there were hundreds of Glass wearers walking the show floor–undoubtedly with information that was sorta’, kinda’ useful to the wearer. I was never a Bluetooth earbud fan because I never wanted people to know that I really was just talking to myself and the device simply gave me another excuse to do it. The Google Glass (and wannabes) is even worse because you’re never really sure if the wearer is paying attention to you or reading your LinkedIn, Facebook info. My wife wouldn’t let me wear the $1,500 face computer if we’re out to dinner because: a) she doesn’t want folks staring at us and b) she wants me to focus on what she’s saying (obviously, I leave my phone in my pocket as well). Wear it driving down the road? Folks have already received tickets for wearing them; and when I’m driving, I need to focus on the idiots around me. Frankly, I’ll opt for a brain chip implant like the dude in the new TV series, Intelligence. Then, I’d have my own personal black box that no one would see (stare at), everyone could tap into and my kids could hack. The only thing I’d have to add is an “Intel Inside” tattoo. The biggest challenge I see for wearables is their long-term success. Gen X, Gen Y folks wear ‘em … preteens, teens, 24ers don’t wear gadgets. Focus folks … focus on the generation that will be the customers tomorrow! While the smart home is starting to get traction, the big (really big) noise at CES was 4K UHD TVs. Not certain why I want a bendable, curved TV screen, but still the imagery was awesome. Cable folks (who have been steadily losing customers) were quick to say 4K content wouldn’t be delivered in volume for years. But broadcast folks said it was a whole different picture from the 3D fervor that went nowhere except in the theater. 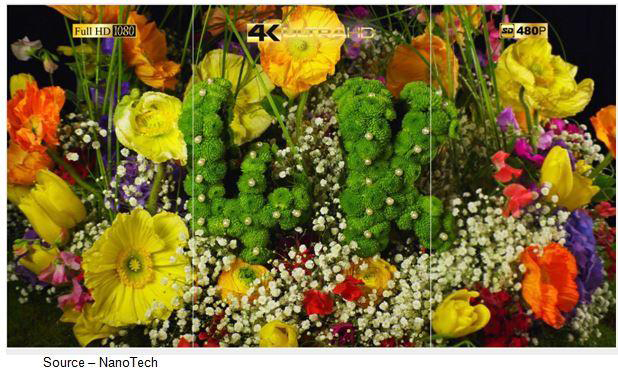 Video Beauty – 4K UHD screens – large and small – were almost everywhere at this year’s CES. Cable companies have been quick to point out 4K content isn’t widely available (and won’t be on their pipes for years) but firms like NanoTech showed how they could repurpose – not upscale – entertainment that looks like native 4K and smoothly streams to the home’s typical 10mb broadband connection. I talked briefly to a senior executive at Fox about the availability of 4k content, and he said it would be available pretty quickly to consumers–first as OTT (over the top or via the Internet) then satellite, broadcast and ultimately cable. He pointed out that all of the new sets are Internet-ready smart sets, so while people may be dropping their cable video services, they’re still keeping their cable Internet service (of course, broadband people want you to end that relationship as well). There were plenty of OTT streaming media boxes shown at CES, but the only 4K streaming media solution we saw was the Nuvola from NanoTech. For under $300 it also handles video games as good as my kids’ Xbox and PS4, and does all of the Android stuff the Lenovo living room PC does for a lot less and streams 4K content. Heck, the UHD streamer and UHD set even improve regular “old” HD content. But as DreamWork’s Lincoln Wallen said, content is still king and younger viewers want it on their terms not on yestereyear’s cable/network linear fashion. As much as they showed off the beauty of their huge screens; Samsung, LG, Sony and others were talking up the content folks who were offering up free, fermium and VOD (video on demand – paid) content from all the studios and content owners. Of course, the cable folks piped up that they’ll be delivering their 4K content to the folks who stick with them … soon. But no report on CES 2014 would be complete without mentioning the product that was not only totally different and totally overpriced but totally awesome. Shiny Orb – While 1TB of storage in a bright shiny globe isn’t for everyone, LaCie attracted a lot of media attention for it’s dressed up hard drive. LaCie – the folks who make storage an artform – didn’t disappoint the media. People couldn’t keep their hands off the 1TB “portable” HD.